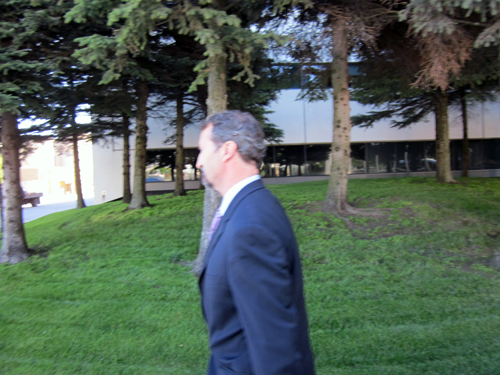 Arnie Fuglvog pleaded guilty to federal Lacey Act violations in federal court in Anchorage Thursday. As part of a plea deal reached with federal prosecutors, Fuglvog will be released on his own recognizance, pay no bail. Fuglvog is charged with falsifying fishing records in 2005. At the time, he was a member of the North Pacific Fishery Management Council. Judge H. Russel Holland presided over the arraignment Thursday morning, asking Fuglvog if he understood all aspects of the proceedings. Fuglvog only answered “yes sir” when Judge Holland questioned him regarding the plea arrangement. The plea agreement involves a 10 month prison sentence plus a fine. If the judge rejects the plea deal, Fuglvog can withdraw his guilty plea. The process would start over and Fuglvog could then request a jury trial. Lacey Act violations carry a one-year prison sentence and a $100,000 fine. Federal prosecutor Andrea “Aunnie” Steward told the court that Fuglvog had cooperated fully throughout the process. Steward said the government is not seeking Fuglvog’s detention at this time and has no objections to allowing him to travel to Canada in the near future. She said if the judge accepts the plea agreement at sentencing in November, the fine will total $150,000. “The defendant Arne Fuglvog has agreed to pay the fine of 50 thousand dollars as well as make a community service payment of one hundred thousand dollars. The money will be directed to the National Fish and Wildlife Foundation to be directed for the purpose of enhancing fishery habitat in the coastal areas of the Gulf of Alaska. The purpose of that community service payment is to directly address the harm that resulted from Mr. Fuglvog’s overfishing his IFQ in that statistical area, in that geographical location,” Steward said. Steward said Fuglvog no longer owns his Individual fishing quota or IFQ because he had divested himself of them before the court proceedings got underway. She says NOAA cases of this nature would typically involve some type of sanction or seizure of the IFQ. “When they are dealing with violations, they often have penalties against an individual’s IFQ. If the individual no longer has the IFQ, then there’s other remedies that are sought,” Steward said. Judge Holland then outlined the sentencing guidelines, telling Fuglvog and defendant attorney Jeff Feldman that the court will make its own decision on how the guidelines will be applied. Holland then told Fuglvog that he still had time to walk away from the deal and seek a jury trial. Fuglvog waived that option, and entered a guilty plea to charges that he knowingly submitted false records and that the fish he caught at the time were intended to cross state lines. Both Fuglvog and attorney Feldman were tight lipped as they left the courthouse. Judge Holland accepted the plea of guilty as charged, and has set a sentencing date for November 18.